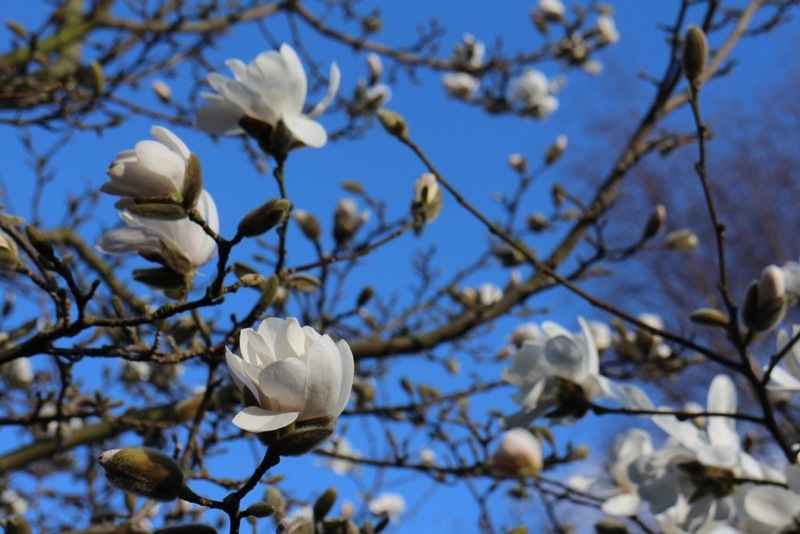 It’s been the most beautiful Spring day today, absolutely gorgeous. The sun has been shining, perfect for the first Greek BBQ of the season, at my parents’ house – and the men sat outside. In March. 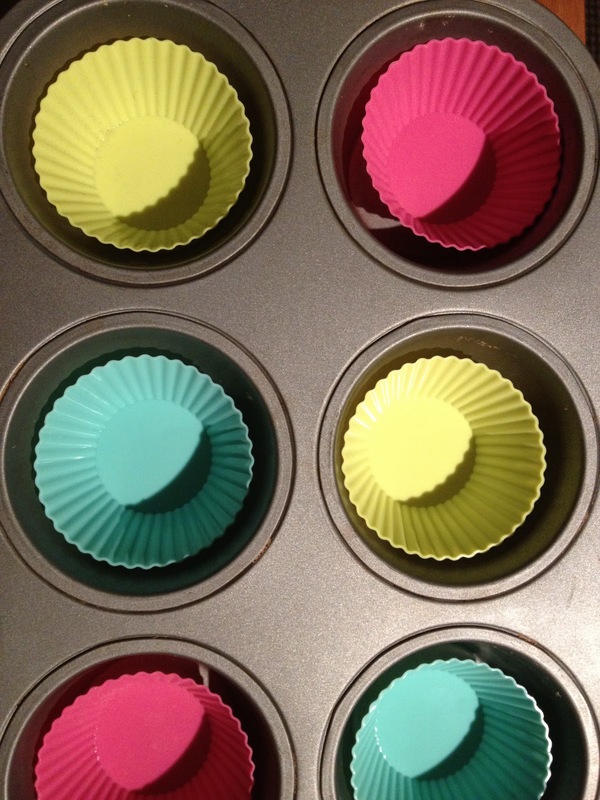 Have you seen the #100daysofhappiness hashtag popping up everywhere? 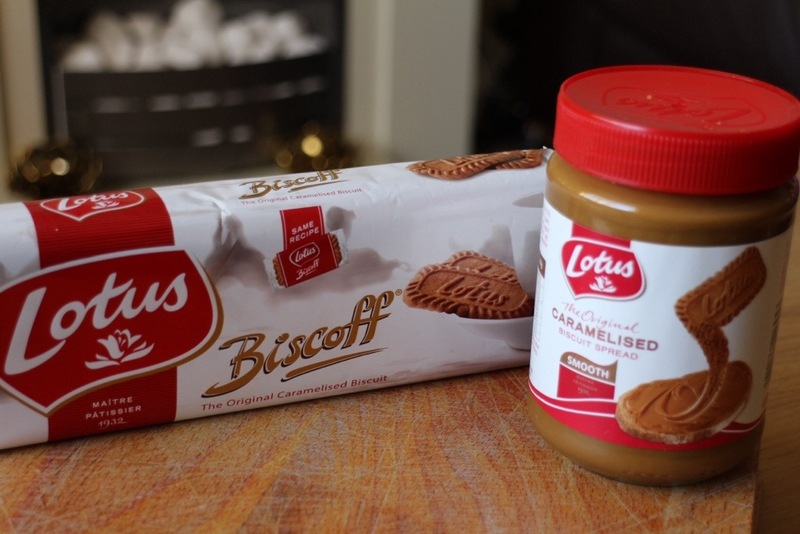 My #day2 is Biscoff biscuit spread and Biscoff (Lotus) biscuits. Preferably together! Yes they make me happy. I know I’m last to catch up with these, but maybe that’s a good thing right? I’m not to be trusted around them. I’m pretty sure I could eat the whole jar straight off. So, I needed something to take to my parents. 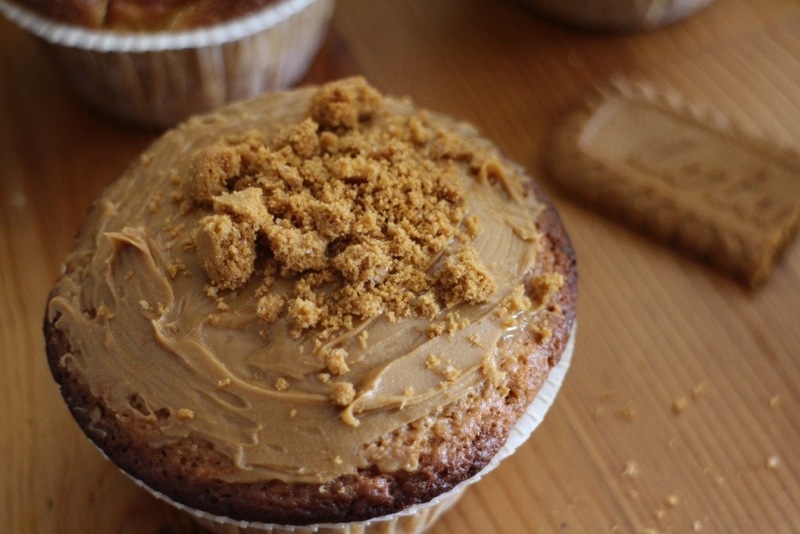 Apple cinnamon Biscoff muffins were created. 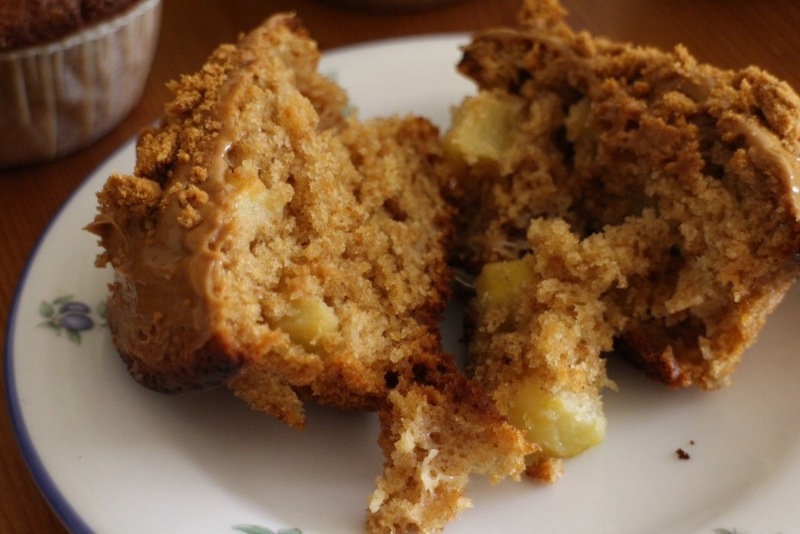 It’s an easy peasy lemon squeezy kind of recipe, diced apple chunks, ground cinnamon and chopped walnuts in a part-wholegrain spelt, brown sugar and honey batter. About half a (380g) jar of smooth Biscoff biscuit spread. 1. Mix all the ingredients up together for the muffins, making suet they’re well mixed, but not over mixed. 2. 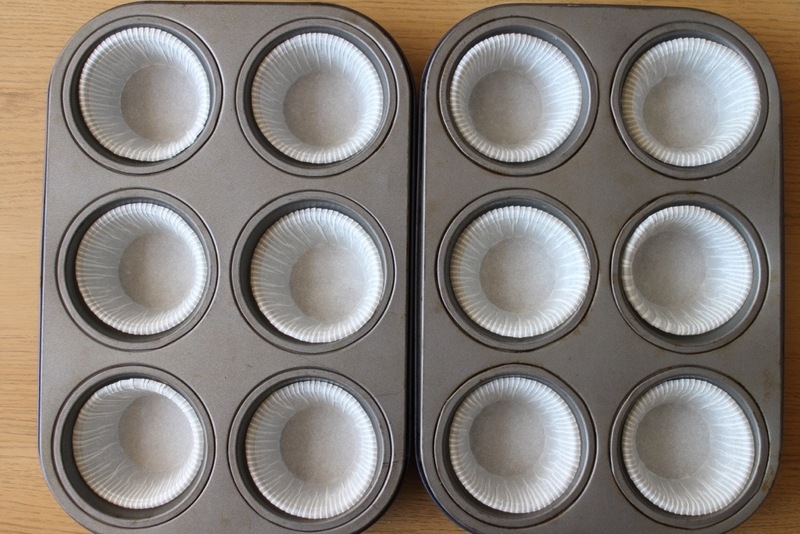 Fill 12 muffin cases 2/3 full. 4. 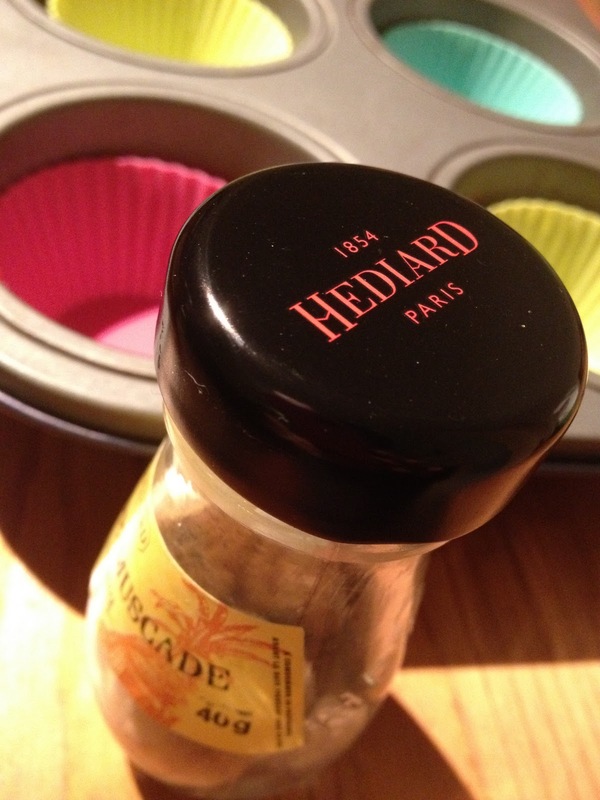 When they are cold, spread with a tbsp or so (however much you want really) of biscuit spread and top with the crumbs. 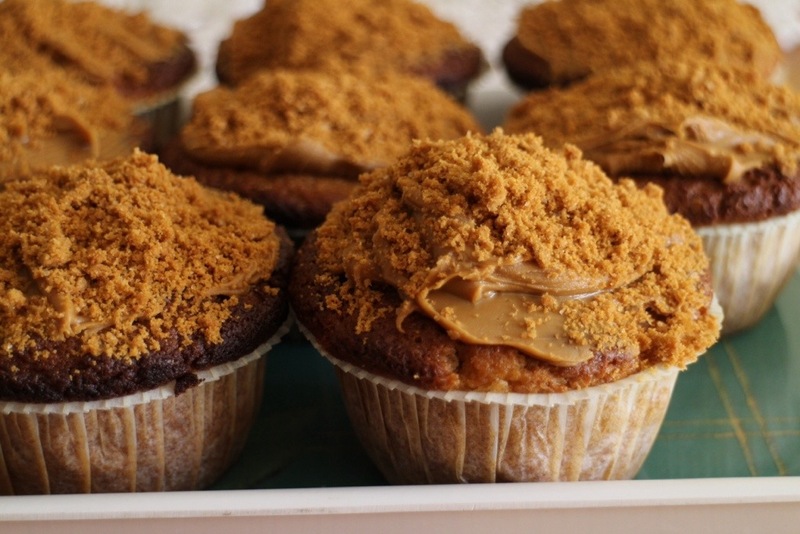 Who doesn’t love the classic combination of apple and cinnamon? 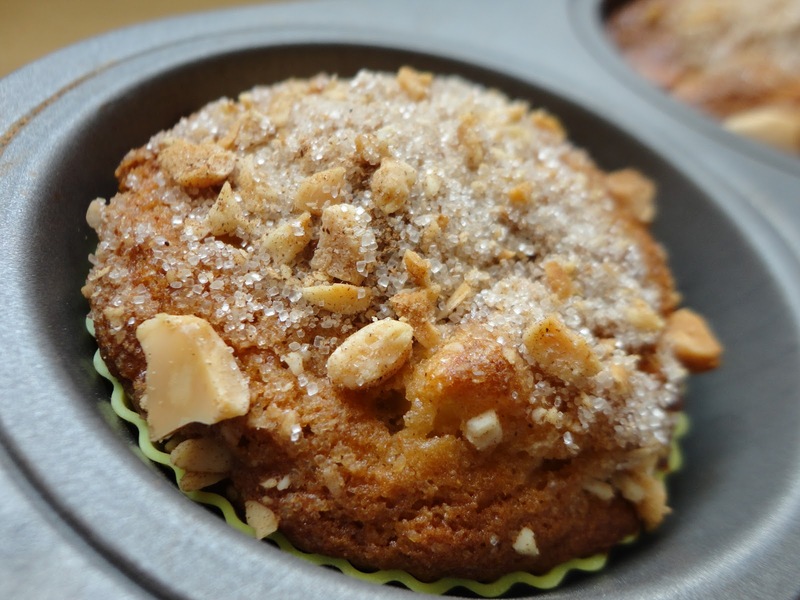 Nothing brings these muffins quicker to mind than a couple of apples sitting languishing in the fruit bowl. Warming and homely, the entire kitchen smells divine! Rushing around today, on my morning off, I wanted to whip up a little something to treat my family and the staff who work for us in our business. What could be nicer? So, amidst thoughts rushing round my head, of new cameras (Canon or Nikon?) The Gym (Which class can I try next? Am I good enough to try advanced step?) they came into being. Adapted from ‘Kitchen’ by Nigella Lawson. 2. Peel and core the apples and chop into small dice. 3. Measure flour, B.P and 1 tsp. 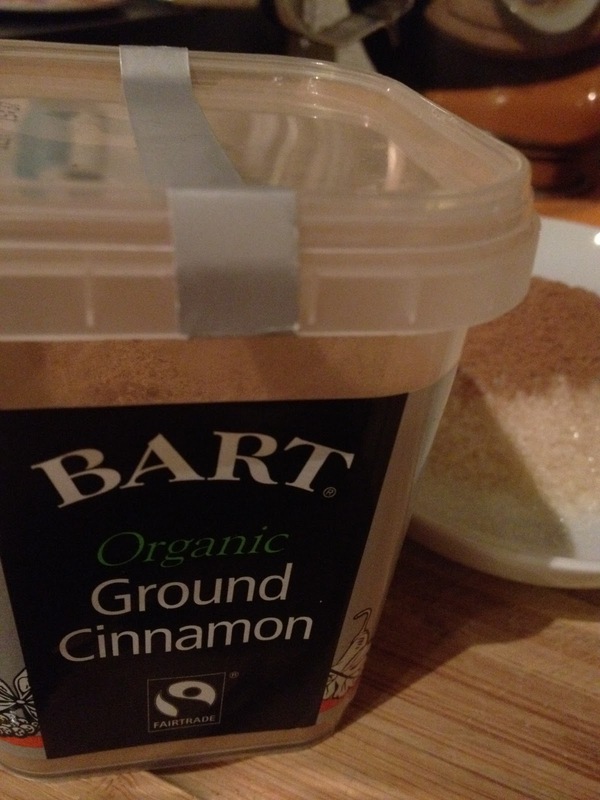 of the cinnamon into a bowl. 4. Whisk together the brown sugar, honey, yoghurt, vegetable oil and eggs in another bowl or jug. 5. Chop almonds roughly and add half of them to the flour. Put the other half into a small bowl with the other tsp. of cinnamon and the 4 tsp. of brown sugar. 6. 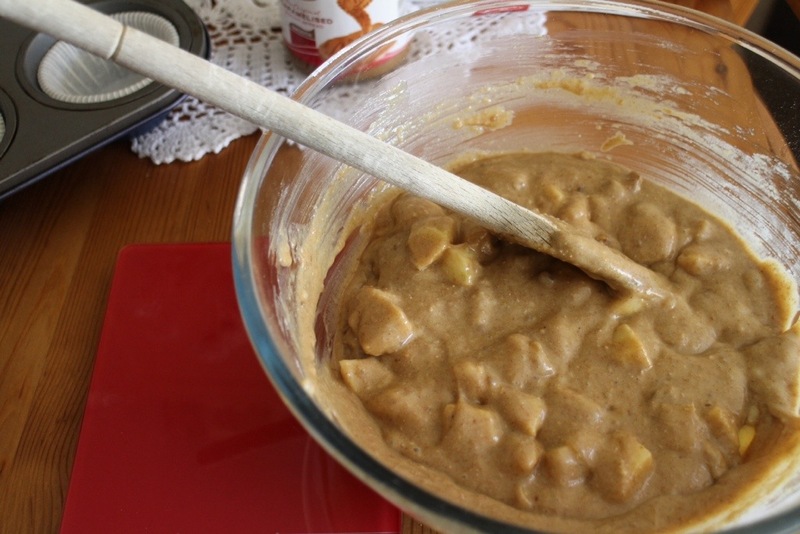 Fold the wet ingredients into the dry, add the chopped apples. Stir to combine, but don’t overmix. 7. 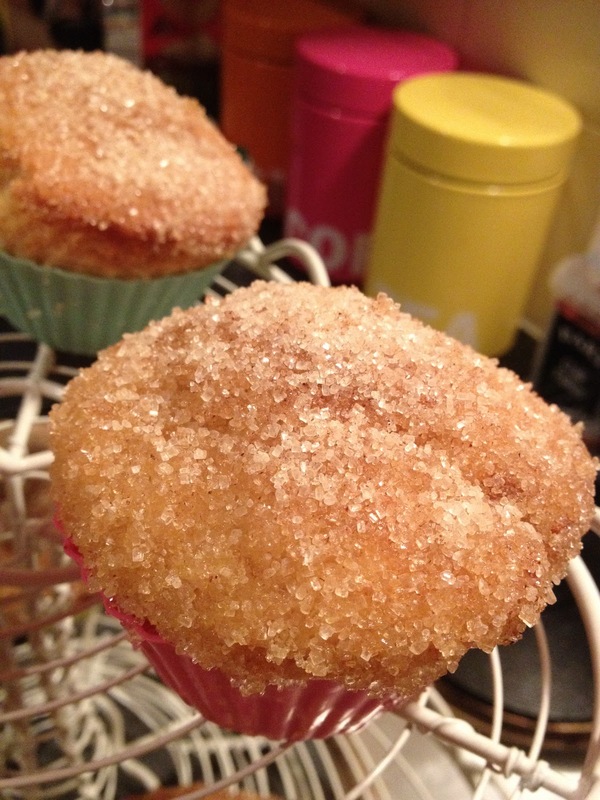 Spoon mix into muffin papers, top with the nutty, cinnamony, sugary mix. 8. Bake for 20 mins. 9. Once they are golden brown and cooked through, let them stand out of the oven for 5 minutes, before transfering to a wire rack to cool. 10. 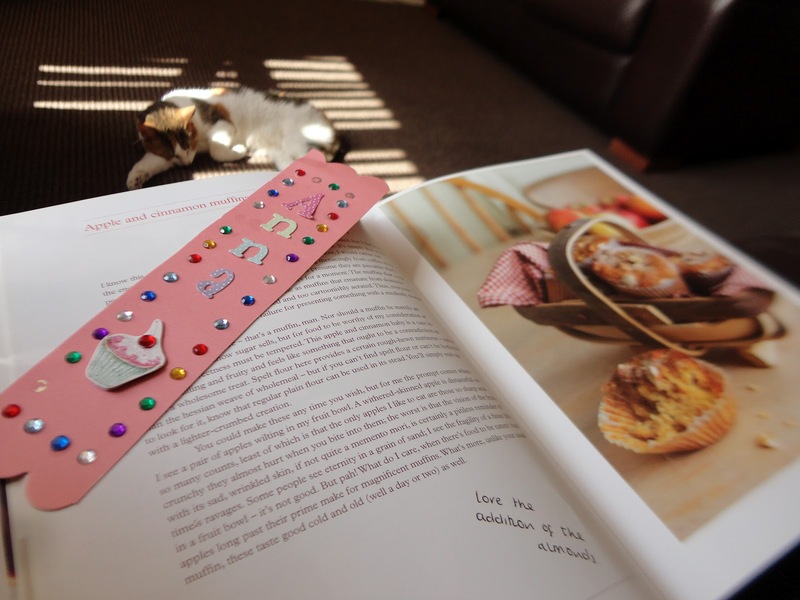 Serve with a lovely big cuppa! 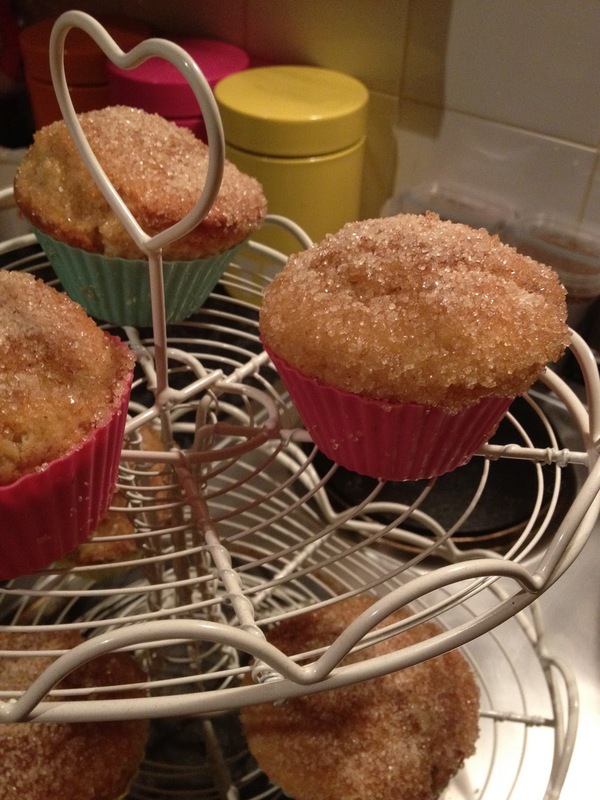 No, not in that mug…..in that BIG one…..should last while you’re scoffing a muffin….or two.